Virtua Hamster is an unreleased racing game that was in development for Sega’s 32x, designed and produced by Eric Quakenbush. The player would have controlled a series of rodents on wheels, to race in 3D mazes, trying to avoid an huge Mechanical Snake. The project was cancelled when Sega discontinued the 32X before production could be completed. Some playable prototypes of the game still exist and they were sold in various auctions on ebay. An early alpha of Virtua Hamster was finally released in August 2009 by SEGASaturno. The game was later ported to Saturn but cancelled again when the game was almost complete. Sega still owed payments to the developer of Virtua Hamster, David A. Palmer Productions. David A. Palmer revealed to Unseen64 that “the entire intellectual property of this game and code” was signed over to his company as part of a legal settlement. Setting: The majority of the game takes place in a mad scientists lab facility. The scientist has assembled a truly humongus habitrail-type maze in order to test his rocket powered rodent experiments. Characters: Player One is a test pilot hamster from a rival lab and was stolen by the mad scientist. Player One’s goal is to retrieve all of the stolen blue-print pieces and escape from the lab. The hamster pilot has to navigate the complicated maze as well as fend off evil rocket riding rodents, a mechanical snake, and the scientists voracious cat. Thanks to Ryan Jacques and David A. Palmer for the contribution! 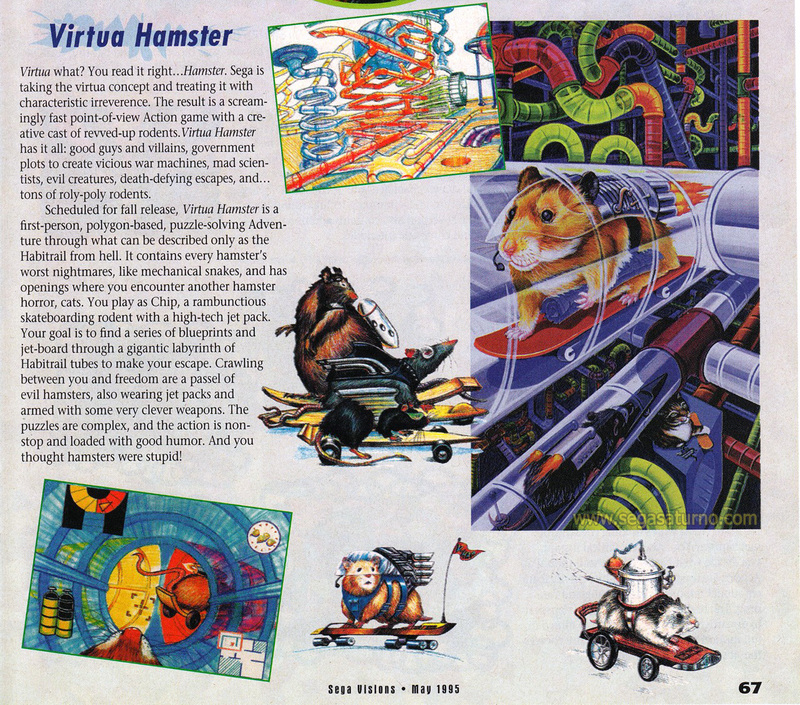 You can read more info on Virtual Hamster at Sega 16. Disclaimer: We are not responsible for any content of any website we have linked to.